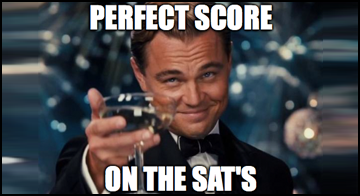 Every once in a while, you'll hear a story about a student who received a perfect score of 2,400 on their SAT's. This week, we were planning to do a story about one of these students, and share some of their secrets with you. But in our research, we discovered the craziest thing. There's a test prep company from Texas that's churning out "perfect score students" in huge numbers. You can see for yourself...here's a YouTube page with interviews of some of their "perfect score students." The secret is superior teaching. Unlike our competitors, Testmasters teachers not only know the test, they are experts in the particular topic they are teaching. Testmasters teachers not only love to teach, they love what they are teaching. Our engaging, lively, fun presentations are the hallmark of any Testmasters course. The school does classroom lectures, but they've also got an online course available for $699. You can see what one of their online training videos looks like below. Let us know your thoughts in the comments section below. Would you consider taking this school's SAT course?